Imbued with the spirit of exploration and a cosmic sense of destiny, James Gray's big-canvas jungle adventure joins epic company. The real-life story of British explorer Percy Fawcett—made crazy with his vision of an ancient Amazonian civilization but lost to the jungle in 1925—has everything you could possibly want in an adventure tale: mutinous colleagues, cannibals with bubbling pots of fire, spears flying out of nowhere, shrunken heads, blood-hyped piranhas, even an interlude with an opera troupe singing Mozart in the wild. But in the hands of The Immigrant’s careful writer-director James Gray (adapting David Grann’s riveting 2009 book), it has something else that most modern filmmakers would skim over in favor of action: a soulful sense of unresolved wanderlust, and an exquisitely developed tension between family responsibilities and the faint call of greatness over the horizon. Shot by Seven’s mighty cinematographer Darius Khondji—who amasses pink clouds and humid, vine-tangled vistas of elemental struggle—The Lost City of Z feels like it comes out of that epic 1970s moment when filmmakers like Francis Ford Coppola and Werner Herzog dived into the muck on their own personal tests of will. Gray relaxes the pace; this isn’t Raiders of the Lost Ark. Instead, he places the forward momentum wholly on leading actor Charlie Hunnam (producer Brad Pitt once cultivated the project for himself), whose occasional coarseness is a perfect match for Fawcett’s early frustrations as a colonel officer who has been “rather unfortunate in his choice of ancestors,” as one snoot puts it. A Bolivian mapmaking job presents an opportunity for advancement and, with his bushy bearded aide Henry (Robert Pattinson, mining unusual steadiness), Fawcett leaves behind his wife, Nina (Sienna Miller, finely forlorn), and a young child. The first expedition is thrilling, with its murmurs of discovery. But the film locks us in during Fawcett’s second quest, when his own natural humility among the tribespeople—a liberal attitude for the day—is tested by snobs at the Royal Geographical Society, not to mention a fatuous fellow traveler, the famed Antarctic explorer James Murray (Angus Macfayden, supplying humor exactly when it’s needed), and even Nina, disappointed by her husband’s sexist exclusion. 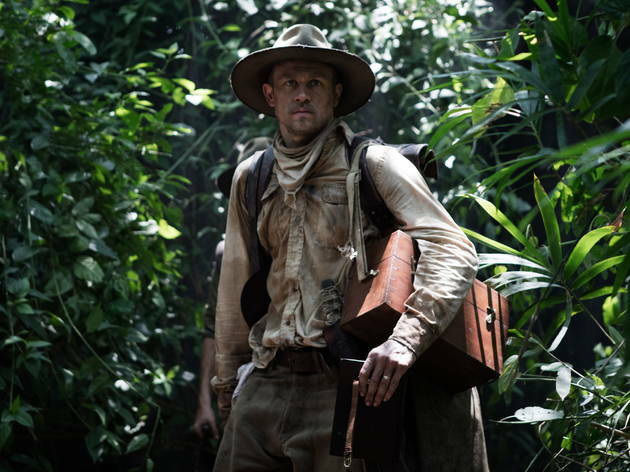 The Lost City of Z is so ambitious during its middle section, complete with tense showdowns in musty London drawing rooms and along grungy South American riverbanks, that you’ll almost explode with joy to realize that Gray has one more turn up his sleeve (too good to ruin here). Even as World War I and deployment on the French front lines waylays Fawcett, there he is, crying in his hospital bed at the glories he has yet to explore. The grandeur of this movie is off the charts. For a certain kind of old-school film fan, someone who believes in shapely, classical proportions and an epic yarn told over time, it will be the revelation of the year. This movie was a real callback to classically shot, slow-paced films the build like Lawrence of Arabia or Barry Lyndon. See it on 35mm (on which it was shot) rather than digital if you can - to really appreciate the depth of cinematography and enhance the feel of nostalgia. It’s always incredibly eye opening when a truly story is underrated from 100 years or so ago that the majority of us never knew happened. Percy Fawcett was a soldier come explorer who became fascinated with the Amazon after being posted there to create maps for the British Geographical Society. He was ridiculed at the time for suggesting that there were sophisticated ancient civilisations that developed ways of living and technologies generations before modern Europeans. Only within the last 20 years was concert evidence discovered which vindicated his beliefs. Charlie Hunnanm is excellent and very believable in the lead role and - although limited in screen time - Tom Holland also gives a great performance. Surprisingly Robert Pattinson is very good also - this is definitely his best performance and I like how understated and subtlety he played it. Certainly a film I will watch time again over the years.